When we last left our adventuring party, they were being released from jail under contract from the Sutulak City Guard to solve a string of murders and disappearances committed in recent weeks. Captain Warrik gives the party 100 gold each as a stipend for the work they will be doing, as well as a basket of Everlasting Provisions and a Bag of Holding for the group's use. In addition, the party (using The Pilgrim's Diplomacy skill) asks for some sort of written declaration that while they are investigating, they are acting on behalf of the City Guard and are authorized to do whatever they want, so long as they're not killing people randomly. They also ask for the silvered dagger Ulric used to kill Jamie, arguing that it might be useful to know where he purchased it, or if he used it elsewhere. Warrik gives the party some leads to start with. The local Brothel is a hotspot of underworld activity, so somebody there might know more about local events. They could also examine Jamie's body at the nearby morgue, or the Green Dragon Inn crime scene. The Marketplace district would be the place to go to find a Blacksmith, and the local Mage's Guild would have info on Ulric if he is a member. The group also asks if they can still use the Inn as a place to rest, and Warrik admits that the crime scene is technically just the downstairs area, thus the upstairs rooms are still clear. With that, the group leaves the Jail and decides to start in the Marketplace, since they have a pocketful of gold to spend. The Marketplace is a big district, since Sutulak still functions as a major trade city. Within the district, the shops and vendor shacks are grouped by class. The party moves through the fine goods areas and goes looking for the shadier areas. Specifically, The Pilgrim is looking to acquire some thieving tools. 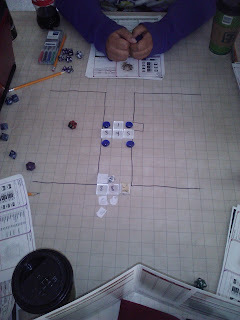 After a couple shadowy alleyways, the party finds a small stand off a dirty road operated by a couple men garbed in tattered cloth and torn hide. Pilgrim asks if they have any "unconventional" wares, and after some negotiation he produces a shopping list. Lockpicks, footpads, a glass cutter, grappling hook, the usual tools of the trade. The traders put several items into a small burlap bag and hand it over in exchange for 80gold. This makes Pilgrim suspicious because the total value of all those items is more than what he's paying. However, he doesn't pass a Perception or Insight check to notice anything is amiss, so the sale is made and the traders find an excuse to leave. The party decides to go to the Blacksmith next. However, on the way, a Passive Perception check is passed by Freyja, Azryn, and Clastoptera, who notice they are being followed by a couple of unrecognizable figures in the crowd. They inform the rest of the group, and Pilgrim chooses this moment to duck into a nearby alleyway to pee. The party continues down the street, and the figures follow Pilgrim into the alley. Pilgrim is standing against the wall in the middle of the alley as the figures approach him from behind...and from up ahead, boxing him in. Upon closer inspection they turn out to be a pack of goblins. Several lackeys, some thugs, a Bugbear for muscle, two lieutenants, and a gang leader. The gang had observed Pilgrim dropping gold in the Marketplace and they're looking to take what's left. Pilgrim (truthfully) informs the gang that he doesn't have much left, so the gang leader notes that his armor must be worth something, and orders him to strip. Now. Pilgrim obviously declines, if only because his human disguise doesn't extend over his entire body. The gang begins to advance on him, but the rest of the party doubles back just in time and engages the rear pack of goblins. Pilgrim rushes to join his friends, providing flanking bonuses to several attacks. This pisses off the Bugbear, who takes one heavy war pick to the back too many and turns on him. Bugbear fixes Pilgrim with a Predatory Eye, then nails him with his Skullthumper Encounter power, which lays him flat out and dazes him. He's severely wounded, and the goblin lackeys around him are taking easy pokes at him to finish him off. Oizo makes use of his racial ability to telekinetically drag Pilgrim out of harm's way. Azryn starts cutting down lackeys left and right, Freyja casts Icy Terrain to trip up some enemies and Clastoptera changes into various beast forms to rip into the goblins. The goblin leader sends his lieutenants into the fight, who manage to do some damage to Oizo and Azryn before they ultimately go down, along with the rest. The leader, upon seeing the rest of his people cut down, flies into a rage and rushes the party alone. He's four levels above the group, but alone, so there's no guarantee of success. Pilgrim takes a Second Wind to recover some health and take a shot at the leader, but a quick sword slash strikes him down and leaves him unconscious and bleeding to death. Azryn and Oizo attempt to flank, but the goblin leader shifts each turn to focus on one opponent at a time. Clastoptera takes long range shots while Freyja tends to the dying Pilgrim to stabilize him. She feeds him a Health Potion to heal him back to fighting condition, and he rejoins the fight. The goblin leader continues his rampage, attacking anyone who approaches and slowly backs away to keep the fight on one side. He makes it to an alcove to keep himself from being surrounded, but Oizo uses a Lightning Lure to pull him out and he finally goes down under a combined assault. Changing the subject, the party produces Ulric's silvered dagger and asks the Blacksmith if he knows about it. As it turned out, the Blacksmith admits to having silvered this dagger for Ulric earlier in the month. Apparently Ulric needed it for some ceremonial purpose, but beyond that he doesn't know. Clastoptera lets slip that the knife was used to kill Jamie, and the Blacksmith is stunned silent. For a long moment, he has no words, lost in thought. Eventually he snaps out of it and informs the party that city law requires all weapon smiths to take customer information when deadly weapons are purchased, in the event they are used to commit crimes. Given that the party has Warrik's letter, the Blacksmith provides the party with Ulric's home address. As the group goes to leave, the Blacksmith adds two pieces of additional information. One, Ulric wasn't alone when he came for the weapon, and two, he smelled of meat. The party's next stop is a Magic Shop. By which I mean potions and spells and wands, not handkerchiefs and trick cards. As the party approaches the shop, an easy Passive Perception check lets them catch some noises from within the shop. Specifically, angry shouting. "Put it down!" "You put it down!" "Drop 'em!" "I'll drop you first!" And so on. 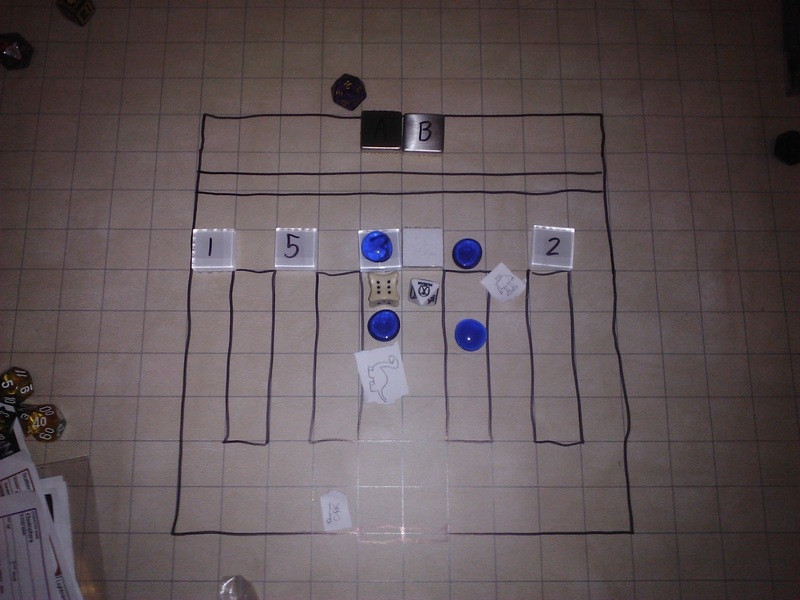 The party busts through the door, weapons drawn, to find a mexican standoff taking place between two wizards and a band of thieves. Did I mention I love easy maps? The shop features multiple shelves of books and potions, as well as various magical and ceremonial materials. Tall shelves are spaced throughout the shop, with a long wooden counter at the far end. Behind the counter are two wizards, one old and short with a long white beard, hefting a long staff. The other is taller, younger, with slicked back blonde hair and a wand raised at the nearest bandit. The thieves themselves are a mix of human bandits wielding maces and a pair of elven archers. A quick discussion between the party has them deciding to side with the wizards in this fight, so they get a surprise round against the thieves. Oizo, Azryn, and Pilgrim rushed forward to engage the bandits in melee while Freyja fires Magic Missiles at range and Clastoptera mounts a nearby bookshelf to lay down spells from on high. Pilgrim unleashes his Cloud of Darkness to conceal his attacks, preventing the bandits from coordinating their attacks and keeping the fights 1-on-1. Clastoptera takes an arrow in the arm from an elf archer, who catches a face full of hornets in response and is stung to death. Another bandit manages to get around the shelves and engage Freyja directly, who backs off from melee combat to blast him with her staff. Azryn chops his foe in half with his great axe and Oizo buries his blade halfway through a bandit's head. Pilgrim uses a non-lethal attack to take one of the bandits alive, knocking him unconscious. Editor's Note: As I later found out, you can't just call your attack non-lethal and do the same amount of damage whenever you like. You have to declare it before you roll, and you get a -4 to your attack roll. Also, during the fight Clastoptera makes Stealth rolls to steal random items off the shelf, grabbing an unidentified potion and book without being detected. The fighting done with, the party announces themselves to the wizards, who are thankful for the assistance. The old wizard is Vink Sardo (bonus points if you get the reference), and the young apprentice is Aric Blacktree. The party wishes to question the survivor, and Sardo offers the party use of his basement lab. 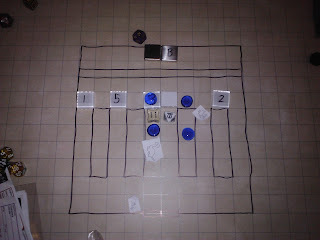 At the end of the session, the party gained enough XP to reach Level 2. They'll be gaining a Utility power, extra HP, and they may choose to retrain one feat, power, or skill training if they wish. Here's hoping things keep going smoothly!